I LOVED Mr. Rogers’ Neighborhood when I was a little girl. LOVED. LOVED. LOVED. Specifically, the mini-scenes acted out with puppets in the land of Make-Believe. I completely adored these characters: King Friday XIII, Henrietta Pussycat, and Daniel Striped Tiger were my favorites. I tolerated the educational lessons before and after just to get to where Trolley would transport us to Make-Believe. The concept of building a set and writing the story and acting out the characters spoke to me. I have been fascinated with live theater ever since and any kind of story-telling. And everyone was so real! King Friday would be selfish. Daniel Tiger would get his feelings hurt. Henrietta Pussycat would stand up for something she believed in. They would fight through the crisis and resolve it. As a lonely and introspective only child, I learned a lot about how to be a person, a friend, a part of a community. Mr. Rogers reminded me of my father. The good parts of my father. They shared the same first name. They wore cardigans. They spoke deliberately. They had a subtle sense of humor. They approached learning scientifically: breaking down a subject, asking questions, and explaining all the nuances. But there were important differences. Mr. Rogers didn’t lecture ad infinitum. He seemed to understand and to be interested in me, in us, in his audience. It was a safe place. As the show and I grew up, I found the expanding neighborhood of make-believe characters to be overkill. I resented the newcomers intruding on my cherished core group. New and bigger was not better. I wanted to hang on to the original small group. I stopped watching – leaving the neighborhood. Flash forward 40+ years and I am in the car on a road trip with my family listening to Jason Mraz, Love is a Four Letter Word, and reading through the “album notes” on the CD. I think I love Jason Mraz about as much as I love Mr. Rogers. He bares his soul with complete joy. May I get to such a place of honesty and love; creativity and connection. Jason quotes Mr. Rogers: “Understanding love is one of the hardest things in the world.” I whoop with pleasure. I am not the only one who finds Mr. Rogers to be a role model, a philosophical mentor. 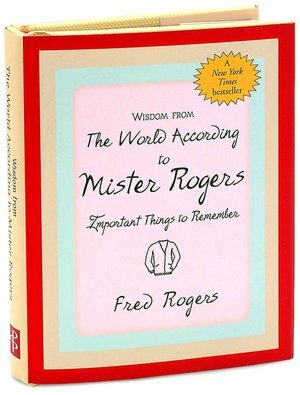 And I share delightedly with my family the connection between me and Jason (my husband is jealous) and the name of the book from which the quote is published, The World According to Mr. Rogers. We return home and life returns to its relentless pace. In the middle of its relentless pace, I turned 50. It was a wonderfully ordinary special day where I felt loved, felt appreciative of my friends and family and felt proud of where I am today. And then my daughter gave me my birthday gift. My very own copy of The World According to Mr. Rogers. WOW. I was completely surprised and delighted and in awe of her thoughtfulness. The best gift is one that shows the recipient that the gift-giver knows you and loves you – soul to soul. Namaste, beautiful girl. You understand love. Great post! I’m mildly obsessed with gifting myself as you might be able to tell from my url and I added yours to my Blogroll.